I've been truly blessed to be a part of an interesting new theater project this spring. 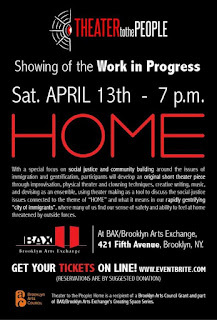 I've collaborated with the Argentinian actress/director Julia Cavagna on a series of theater-making workshops for adults in Brooklyn, bringing together people who are not usually in a room together, people who've immigrated here recently and people who have lived here all their lives, people with theater experience and people who have never been on stage before, people in their 20s to their 60s, people who have five different first languages (English, Spanish, Quiche, Swedish, and Japanese). 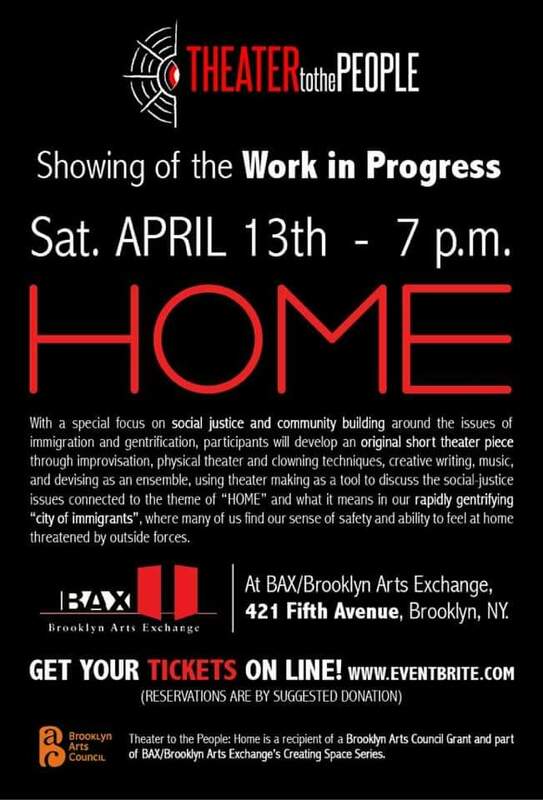 We have all come together every Monday for the past six weeks to use theater as way of thinking about HOME. We're also exploring how collaborative creative practice can create community across social divides like race/ethnicity/class and help us to brainstorm together to respond to the political and economic challenges that arise when we talk about immigration or gentrification. We would like to share what we've created with all of you and talk to you about it! Come join us on Sat. 4/13!